Misc. : Canned on Dec. 13, 2015 at 1:53 p.m.
Of course Sam sent me this with six Surly Abrasive’s. It feels like I am about two shipments behind, but will after to wait after the thaw. Was really excited for this one and kind of hesitant that a pale ale could really be that good. Here’s to heaven. I'm not getting it, obviously. For this to be so universally revered makes me doubt myself. But I don't love it. It's delicious, certainly. It has some magical quality that's pretty instantly recognizable. But it's kind of anonymous. The flavor profile seems oddly without substance, transparent -- invisible, even. To serve this in a Shaker pint is definitely part of the problem. But I'm just shaking my head. I can't see what all the hype is about. Bomber that I acquired in a trade with @SaulTBauls poured into my SN IPA glass. A: Beautiful golden/range hue. Effervescent foamy heady that leaves enough lacing to get me from NJ to Iowa. S: Plenty of Orange, grapefruit pear with some hints of pine. T: This is so juicy that it should come in a box with a little straw. Loads of grapefruit, pineapple, pear, apple, Slight sweeetness and a little but of resiny pine in the background. Very little bitterness. M: Easy drinking, light body, moderate carbonation. Refreshing, smooth and creamy everything I want in a beer. O: Great Beer. Maybe even reason enough to go to Iowa. Super huge thanks to maximum12 for a growler of this stuff. Dude is an amazing trader and is exceptionally generous, always willing to hook you up. PseudoSue pours the color of bruised pear skins with some goldenrod highlights - it's basically opaque, though I can kind of make out shadows on the other side of the glass. The soapy white head sits at a finger and lasts for a while, leaving behind some good lacing on the glass. As advertised, the aroma is a beautiful citrus bouquet with tremendous amounts of gushing oranges and grapefruits, outline with a softer tropical set-up, something like mango and maybe even a bit of pineapple. The hops also impart a nice grassy note, coming off with some light white pepper as well. It smells like it'll be pretty bitter, or at least every bit as bitter as an IPA. The line between pale ales and IPAs is getting blurred here, but I still love this aroma. The taste is all-together fruity and perfumy, with an obvious hop assault, through and through. The nose was a good indication that the malt would be a bit-part at best, and the first sip confirms that fact pretty quickly, as I'm not really getting much malt flavor at all. What I am getting, though, are copious amounts of pungent citrus, grassy and leafy hops, herbal pepper, grapefruit skins, juicy tangerine and even a faint hint of tropical mango. Very tangy and substantially bitter... PseudoSue joins Zombie Dust in the category of "maybe a bit too bitter and heavy to be a pale ale, but still lighter and more drinkable than most IPAs". The Amarillo and Simcoe combination is beautiful on both the nose and the palate, leaving your mouth with fading fruits, earthy hops, and a back of the tongue, finishing bitterness. Wet and crispy on the palate, nice carbonation, even from the growler; snappy and fresh. This stuff is very good. Damn good. And drinkable to the nth degree. While I've definitely had a fair share of slightly more enjoyable pale ales, this one is valiant enough to join the best of the best club. I enjoyed this only slightly less than What is Enlightenment, and they are reasonably similar beers. When your brew gets compared to something from Hill Farmstead, well... that in itself is a damn good testament to how good your beer is. Had 2 fresh cans with similar results. Not good. Maybe a problem with the new canning process? I've drank my weight in Sue and it's one of my favorites but I think I got some suspect cans. Really disappointing. I may be a little spoiled, as I have been fortunate enough to drink a lot of TreeHouse and Trillium lately, but PseudoSue was a letdown. After reading many reviews and finally getting a hold of some, I'm shocked at how highly rated this beer is. Fully aware this is not an IPA, but there is no punch or character to this beer - it has as much body as a bud light lime. Other reviewers raved about how juicy it is, how flavorful it is, etc. but I'm not sure we're reviewing the same beer... Huge letdown for a big fan of Citra hops. Undeserving of the 4.5 rating, as it's not even close to being in the same class as Lights On or Fort Point. Moon Man still takes the cake for pale ales from the Midwest (*haven't tried zombiedust*). Pours out a typical pale orange kind of color. The aroma is lead by soft tropical fruit notes of peach, mango, orange peel and tangerine. Taste is also very citrus forward with orange, grapefruit, pineapple and mango heavy on the tongue. The body is light and the mouthfeel is crisp. Drinks like a Pale Ale which is nice since a lot of Pale Ales verge on IPA territory anymore. Good beer? Yes! Overhyped? Yes! For single hop Citra Pale Ales there's a certain Zombie king for me. While admittedly two months old, it is hard for me to understand why this beer is so exceptionally highly rated. It is good, for sure- a very enjoyable APA. But I don't find it to be anything particularly special. Citrus and tropical fruit, rather sticky, quite light-bodied. Moderate bitterness. The flavour is good with very low malt flavour. Either the beer falls off a lot after two months (certainly possible) or my tastes just don't align with most. It's a very good APA, it not something to kill yourself trying to acquire. Depends on where it's brewed. The 4 pack bottles from florida were extremely disappointing. The 4 pack cans are much better. But the best sue still comes straight from Decorah. A: Heavy orange juice haze with the pulp. Finger of loose off-white foam after a moderately strong pour. S: Citrus, earthiness, papaya, mango, and some hot spice. M: Pillowy med-full body. Almost lighter than air feel. T: Papaya, orange, mango, and tangerine sits on the tongue. Light yeast and bready notes follow, but experience is firmly sweet tropical with that hint of tamarind/clove spice noted in the aroma. This along with the citrus pop keeps it from being cloying, and makes it quite fashionable. O: the best pale ale I've ever had. But still just a pale ale. Orange, light and bubbly. Slightly cloudy. Grapefruit smell was strong and immediate. Hop smell was also strong, but not as noticeable during the pour. A: Pours a clear light golden amber with lots of visible lively bubbly carbonation. Head is and inch and a half of frothy foamy white color. Retention is absolutely excellent and lacing is phenomenally plentiful. S: Wow what inviting aromas of tropical fruits, and citrus that present themselves immediately. Mango, grapefruit, pineapple, lemon, and tangerine are the prevalent smells. Then in the middle you find aromas of sweet malts, and fresh cut grass. On the end you get some floral hop notes. Absolutely fantastic this is one of the best smelling brews I've ever had. T: This brew continues to blow my f***ing mind. Opens with huge bold citrus and tropical fruit flavors. Mango, grapefruit, peach, orange, lemon, pineapple, tangerine, and cantaloupe flavors are all present to me. In the middle of the taste you find sweet malts, and grassy/pine like hop bitterness. Finishes with floral hop flavors and a nice lingering bitter/fruity aftertaste. M:Light to medium bodied with a moderate amount of carbonation. Incredibly smooth and easy drinking. It's qualities make it almost too easy to drink. This is a perfect all/every day kind of brew but it has such depth of aromas and flavors that I feel like I am committing a beer crime for how fast I am drinking these. I love this beer but I wish it had a slightly heavier mouthfeel. O: This is one of the most impressive brews I have ever had. 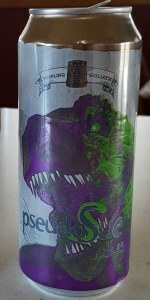 I have heard such great things about Toppling Goliath and finally we get distribution to our store. I picked this up immediately after work and proceeded to have my brains blown out of my f***ing head like a .50 cal round hit me. This is easily the best Pale Ale I have ever had the pleasure to consume. This will forever have a place in my heart and has immediately become one of my favorite beers. I plan to drink the f*** out of this. I would stand by my recommendation of this brew to my death. Seek this brew out beer lovers far and wide, this is truly a white whale that deserves any amount of praise heaped upon it. The beer comes in a slightly hazy golden orange. The aroma is bright tropical fruit and citrus. Pineapple, grapefruit, citrus zest and just shines of Citra. The flavor follows with those tropical and citrus fruits. A really zesty flavor with a very light bready malt in the middle. A light bitterness in the end, which is appropriate for the style. An extremely clean drinking beer and holds even more fruits than Zombie Dust (an also Citra single hopped pale ale). A: Pours hazy (with a few small floaties) golden orange amber with a frothy off white head that settles to a firm layer and leaves some very nice lacing. S: Ripe fruit leads, passion fruit and peach, maybe a hint of mango, some citrus, orange, grapefruit, lemon lime, biscuity malt, and caramel sweetness. T: Fruity tropical citrus nectar of the gods. Passion fruit, peach, apricot, orange, lemon lime, grapefruit, lychee, lightly toasty biscuity malt, and a touch of caramel sweetness. M: Medium body, moderate carbonation, very smooth. O: File this one under wish list beers I wasn't expecting to have fall into my lap. Canned in Florida and not super fresh, so as difficult as it is to imagine it being even better, it no doubt could be. Outstanding showcase of all that Citra hops! Poured from 12oz bottle into a clear mug. I'm damn excited about this one! Bottle is dated 7/9/15. Appearance: medium orange hue with a moderate haze and a strong effervescence. Head pours a finger of frothy off-white foam. Quite attractive! Smell: a piney hop aroma with a nice citrus backdrop. Not quite massively fruity but very enticing nonetheless. Taste: very nice piney and lightly citrusy hop flavor with a smooth finish exhibiting a balanced bitterness. One of the smoothest and most satisfying pale ales I've ever had, with a brilliantly satisfying finish. Mouthfeel: medium body with a good level of carbonation and creamines. Quite good. Overall: highly drinkable and very, very satisfying indeed. I was expecting a flavor bomb, but what I got instead is one of the most easy-drinking pale ales I've had. Great. Score is based on the original Toppling Goliath Iowa-brewed version. The Lakeland, FL Brewhub version and the original are two are vastly different beers, with the Brewhub contract version being inferior. This is certainly one of the highest-rated APAs on BA, and it's one I've wanted for a long while. Thanks to TG's expansion into the MA market, I hope to be able to pick it up fairly regularly because... it's awesome! I'm not surprised, but it's always good to feel vindicated for personal high hopes based upon the BA community's reverence for a particular brew. In other words: when something lives up to the BA hype, I become further convinced this is the very best beer community on the Internet! This pours an insanely hazy, nearly-opaque orange color with a dollop of creamy head that seems to last for quite a while before sinking to approximately a finger-and-a-half in my glass. It leaves behind solid lace and some sticky, inconsistent lace. The surface is almost fully-obscured, with some bubbles congregating in small pockets. From what I can tell, this bears a fair-moderate carbonation, but the streams are not easy to notice considering the haze. The nose here is wonderfully dank and citrusy with moderate notes of sweet tropical fruit, ranging from ripe mango to papaya and passion fruit. Super juicy smelling with complementing pine resin and dank, grassy, green elements that really shock my senses. As soon as I opened this one, I had to put my nose to the aluminum can to deeply inhale and indulge in the aroma I knew this would produce... my response was no less than an audible proclamation of "fuuuuck," and I knew I would be in good hands. The flavor is chock-full of ripe citrus and mango, with flashes of dankness and slight green onion. Grapefruit rind and papaya crossed with unfiltered/pulp-laden orange juice washes over the palate, providing waves upon waves of intense juicy hop goodness. The malt profile seems slightly dextrin-heavy, keeping things firmly planted on the heavier-bodied side of the APA style (this drinks more like an XPA/Extra Pale Ale than an APA... kind of between an APA and IPA in bitterness/flavor/feel), lending a bit of biscuity malt backbone betwixt the intense hop throwdown. Carbonation is rather steady, with a finish that leans dry and chalky with a bit of extra hop pellet goodness. However, it borders on astringent and definitely sips more like an IPA than a traditional, easier-drinking APA, but I'll give it a pass because it's just so damn good. If I can get this fresh and often, I absolutely will. So good to finally be able to have a beer I've only been able to read about for years! Thanks to drewone for sharing this one. Pours a hazy honey orange with a foamy bone head that settles to wisps of film on top of the beer. Small streaks of lace form around the glass on the drink down. Smell is of malt, citrus zest, and herbal hop aromas. Taste is much the same with citrus zest and herbal hop flavors on the finish. There is a mild amount of hop bitterness on the palate with each sip. This beer has a lower level of carbonation with a slightly crisp and medium bodied mouthfeel. Overall, this is a good beer that is tasty and easy to drink. One of my all time favorites.. I want so bad to like this beer but just can't. The best part is the look and smell. I like the other TG offerings much more. Have had Sue a couple times now and see it as no more than average at best. Sorry TG. I just don't see it. Look: Your typical looking IPA. A bit darker than most. Smell: Very fruity and a somewhat hoppy smelling brew for an IPA. Personally I'm not huge on insanely hoppy IPAs so I actually enjoy this. Taste: A very easy to drink IPA but you can still taste and feel the hops which is great. Very fruity and fun. If you are looking for an easy to drink IPA and want to put a few back this is a greaaaat choice. Feel: Feels like pretty much every other IPA. Obviously it's no stout but it has a nice mouthfeel. Once again it's easy to session because of this. Hopefully the beer I drank was from a bad batch. I'm a fan of a citrus beer but this was horrible! I've only poured two beers down the drain because I couldn't finish them and this was one of them. The other beer I poured down the drain was a strong German Eisbock. The first drink of this beer wasn't horrible, grapefruit, grapefruit, grapefruit and some more grapefruit. There was some hop bitterness on the aftertaste on the first drink but nothing crazy. As I continued drinking this beer the grapefruit was becoming so intense and obnoxious it wasn't enjoyable at all. The aftertaste was very funky and long lasting. I have no idea how this beer is ranked 100!! I bought two bottles to share with two of my friends and neither of them could finish it as well. I was so excited to try this beer and it was a total failure in my book. It's hard to say because this is a loved beer by many but this is one of the worst beers I've drank. I'm going to give it another shot, maybe in the brewery. Beer is really balanced but i think it mutes the hop flavors a tad too much. From the tallboy, this is a golden beer with a touch of haze and a fluffy white head with legs. Single hopped with Citra, the aroma is packed with citrus zest and fleshy tropical fruits. It’s very aromatic, herbal and floral, too. Bready malts with fruity mango flavors greet the palate, followed by some juicy apple and background earthiness. The finish is dry, very clean, crisp, and highly refreshing. I'm glad I got to sit down and finally analyze this beer, but pseudoSue is a killer American Pale Ale that should just be pounded from the can.